Halfway through the life cycle of the iPhone 7 and 7 Plus, Apple released the (PRODUCT)RED special edition versions. The red color is available for the two phones with the largest capacities only, 128 GB and 256 GB. Part of the income will go to (RED), an organization that fights for the HIV+/AIDS free generation. This thought might comfort you while you’re shelling out a large amount of cash for the new phone. The specs for the (RED) phones differ slightly across the line. The iPhone 7 is a matte red, closer to orange, while the iPhone 7 Plus is a darker side of red and features a glossier finish. Both phones have an anodized aluminum casing which is completely red, not only on the surface. The Apple symbol in the back is of polished aluminum. The SIM-tray is also completely red. The speakers’ grills are black, while the mute button, front, and bezels of the phone are white. This somehow ruins the otherwise smooth and sleek design. Apple tried to live up to the red color for the box and manual, but the power unit, the Lightning cable, and AirPods are white. So, you won’t be able to match your red iPhone with red earpieces and cables. The top YouTube blogger, JerryRigEverything, tried to replace the screen with the black one, but failed to restore the physical home button. Apple designed the phone so that no one could tamper with their product, as replacing the home button seems to result in the user having to use the virtual home button instead. The Apple (PRODUCT)RED item list includes: MacPro, iPod Nano, iPod Shuffle, Smart Battery Case for iPhone, and the iPhone bumper. 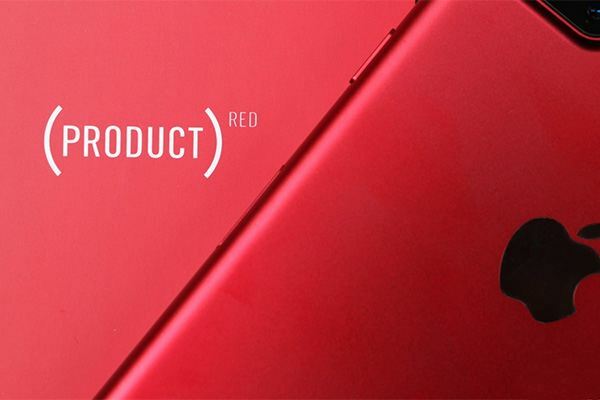 The (PRODUCT)RED initiative is often criticized for shifting the focus from charity to product purchase, and for their lack of money transfer transparency as well. It is feared that the money is landing in the hands of pharmaceutical companies, rather than with the average person who needs it the most. The amount of funds raised through the massive advertising of the products is also criticized, as the ad costs are much more higher than the charity returns. However, it is your choice entirely if you’d like to spend your money on the (PRODUCT)RED iPhones 7, rather than on the basic models. Technically, they don’t feature any differences except for the casing color. Apple – The official website. Sell your iPhone 7 – Get the best price from iGotOffer. Check IMEI – Trying to check IMEI/MEID/ESN for iPhone, iPad, cell Phone, tablet or any other device? You can find complete IMEI history on iGotOffer’s website. We update the database every day. The access is free.